When touring San Diego’s famous craft brewery scene, one thing is for sure: You don’t want to be driving. In that case, why not book a spot inside a 14-seat, open-air, Swiss military vehicle called a Pinzgauer. Carlsbad-based Scavengers Beer and Adventure Tours runs all-inclusive tours in these vintage rides and even includes a Phil’s BBQ lunch. Guests on public tours (offered Thursday, Friday and Saturday) will be asked for brewery suggestions at the time of booking and the three top choices will be selected. Sunday is reserved for groups of 8 or more and private groups can pick exactly which craft breweries in North County they’d like to experience. The tours stick to North County as wear and tear of driving to downtown is tough on the vehicles (though can be negotiated on a case-by-case basis). Some of the breweries on the tour include Stone, Iron Fist, Mother Earth, Breakwater, Port, Aztec, Lost Abbey, Lattitude 33, Ballast Point, Green Flash, Alesmith and Hess Brewing. Tickets for four, 6oz tastings are provided at each stop where guests will spend about an hour getting to know the brewery. A bonus Ballast Point can kicks off the tour and can be consumed en route to the first stop. A meal is included with the tour and if it isn’t Phil’s, it’s probably pizza (see tour details). Vegan and vegetarian options can be rounded up with advance notice. Tours wind up being about 4-5 hours long on average and there’s an opportunity to go behind the scenes at one of the breweries to learn how beer is made. Book either online or by calling 760-208-3739. Group discounts are available but grab a friend and book online in December to receive 10% off using the promo code on their site. Free pick-up and drop-off is offered in the Carlsbad area for groups of 8 or more otherwise the meetup spot is usually by the Carlsbad train station. Of course, all participants must be ages 21 and older! Tour operator Adam Hall has traveled the world to explore various beer styles and techniques, brews his own and enjoys sharing his love of beer with guests. 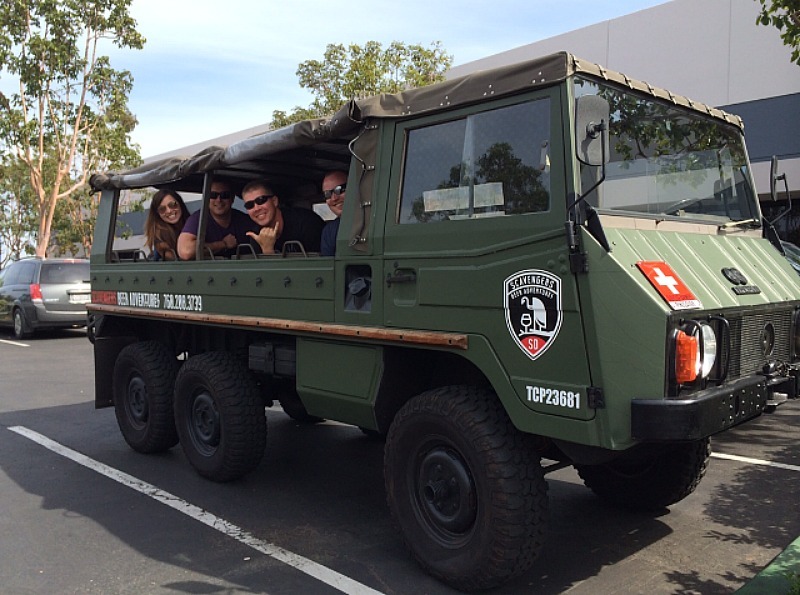 He chose the Pinzgauer because it’s adventurous, uncommon and rugged while providing guests a way to experience San Diego’s ocean breezes and (usually) warm weather. So, tie up your hair, don’t forget your sunglasses and arrange a safe ride home. Want to stumble back to your hotel? That’s easy in downtown Carlsbad–there’s even a list of recommended spots on Scavengers’ website. Have you been on one of their tours? Tell us about it.